→How To Get Rid Of A Lump On Ankle At Home ? Ankle lumps can occur in either one or both ankles and can cause a lot of discomforts. A lump on the ankle is also referred to as an ankle bump, cyst, nodule or tumor. Depending on the kind of lump you have, you may experience softness in the area, inflammation, pain, difficulty walking and other symptoms. As a runner, developing an ankle lump would mean taking a break from your routine until your lump disappears. Since ankle lumps can be caused by various factors, it is important that you first determine the possible cause and then follow appropriate treatment methods. In this article, we will first examine the different kinds of lumps that may develop on your ankle, we will also assess the common causes and finally offer the most popular treatment methods. These include cysts such as ganglia that are related to the tendons and joints. These cysts often have fluid inside and develop over the joint on your ankle. (2) They are round or oval in appearance and may cause inflammation in the surrounding joints and infection if untreated. Depending on the kind of lump you have on your ankle, there may be different causes for the condition. Here are the most common causes of each of the types mentioned above of ankle lumps. If your lump is giving you pain or discomfort, some home remedies may help to alleviate the swelling or irritation and reduce the pain. Bucket with warm water. The level of water should be enough for you to soak your foot in. 1/2 Cups apple cider vinegar dissolved in a bucket of water. The warm pieces of cloth will help increase blood circulation in the area and speed up healing. If the lump is caused by an infection, it may also help to bring the lump to a head. In order to prevent further irritation, do not squeeze, scratch, or pick at the lump. Also never stick anything like a needle into it. Add the Epsom salt in the bucket of warm water and soak your feet. ​Do this for about 15 minutes and repeat it until you see some improvement in the lump. The reason Epsom salts is beneficial is that of its magnesium and sulfate composition. ​Soak your feet in the bucket with the apple cider vinegar and water for about 15 minutes. ​Then rinse your foot and use a moisturizer. The reason why apple cider vinegar works are because it can kill bad bacteria and encourage the growth of good bacteria. ​Make a paste with the cayenne powder and apply this on the lump. ​Cover it with a bandage and leave it overnight. ​Continue to do this ​​​​​for a few night. The benefits of cayenne pepper include its ability to break down toxins in your body and its anti-inflammatory qualities. The active ingredient in cayenne is called capsaicin and it works to reduce swelling. ​Simply massage the warmed oil over the affected foot. ​Then cover it with a sock and leave it overnight. ​Repeat it every night and even during the day. Mustard oil is known to be a good first aid for bruises because of its ability to reduce both internal and external swelling. ​By improving the circulation of blood around the lump, it helps the body to treat the lump. Treating a foot lump does not have to be difficult. Although different types of lumps can be caused by different factors, the treatment methods are similar. Since most lumps on the ankle are benign and therefore not something to worry about, the best you can do is alleviate the symptoms such as swelling and discomfort. Following the four home remedies will do just that. Always remember that when it comes to your ankles, you need to be very careful. Whenever you experience anything out of the ordinary such as an ankle pop, stop what you are doing and first address the issue. Taking for granted small things like this may increase your risk in developing an ankle lump. 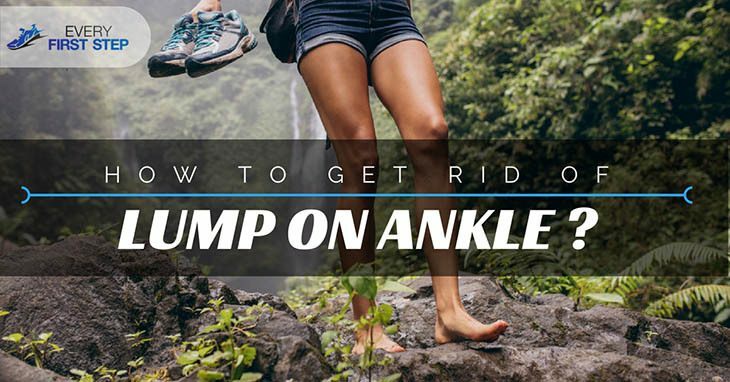 ​Do you have a lump-like growth on your ankle? ​What did you do about it? We’d love to hear any other suggestions or questions about this topic in the comments below. If you found this article helpful, remember to share it with others.